Compared to the information given by most disaster relief charities we've examined, we find this to be an unusually clear and concrete picture of how funds are spent and what activities are carried out. Chronicle of Philanthropy. American Charities Raise &dollar;774-Million for Haiti Relief, Chronicle Tally Finds. http://philanthropy.com/article/American-Charities-Raise/64243/ (accessed September 17, 2010). Archived by WebCite® at http://www.webcitation.org/5vdUVewWU. Chronicle of Philanthropy. 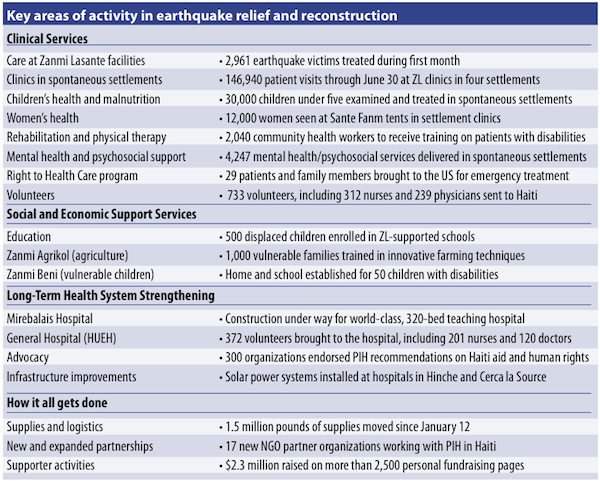 A Roundup of Haiti Fund Raising as of January 29. http://philanthropy.com/article/A-Roundup-of-Haiti-Fund/63823/ (accessed January 6, 2010). Archived by WebCite® at http://www.webcitation.org/5vdUqxgnb. Chronicle of Philanthropy. How Charities Are Helping Haiti: How Much They Raised and Spent. 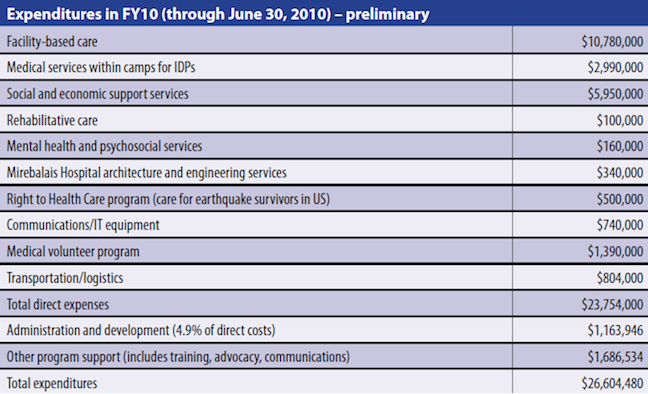 http://philanthropy.com/article/How-Charities-Are-Helping/66243 (accessed January 6, 2011). Archived by WebCite® at http://www.webcitation.org/5vXJzVT1d. Partners in Health. 3-year plan (PDF). Partners in Health. Annual report (2010) (PDF). Partners in Health. Blog. http://www.pih.org/blog/ (accessed January 10, 2011). Archived by WebCite® at http://www.webcitation.org/5vdTz7Z0U. Partners in Health. Home page. http://www.pih.org/ (accessed January 10, 2011). Archived by WebCite® at http://www.webcitation.org/5vdSgWz4L. Partners in Health. Research. http://www.pih.org/publications/c/research-article (accessed January 4, 2011). Archived by WebCite® at http://www.webcitation.org/5vUwQDeos. Partners in Health. Six-month report (PDF). Partners in Health. Stand with Haiti. www.standwithhaiti.org/haiti (accessed January 10, 2010). Archived by WebCite® at http://www.webcitation.org/5vdTe6Qvl. Partners in Health. Stand with Haiti: Six month report. http://www.standwithhaiti.org/six-months/ (accessed January 4, 2011). Archived by WebCite® at http://www.webcitation.org/5vUwIlnFV. Partners in Health. Where We Work. http://www.pih.org/pages/where-we-work/ (accessed January 4, 2011). Archived by WebCite® at http://www.webcitation.org/5vdV5GUV0. Partners in Health. Who we are. http://www.pih.org/pages/who-we-are/ (accessed January 10, 2011). Archived by WebCite® at http://www.webcitation.org/5vdULgJZ8. PIH, “Six-Month Report,” Pg 2. Partners in Health, "Six-Month Report," Pg 2. Partners in Health, "Six-Month Report," Pg 1. Partners in Health, "Annual Report (2010)." Partners in Health, "Annual Report (2010)," Pg 33. Example: for Malawi, PIH states that there were 17606 patients tested for HIV, 2684 HIV patients receiving antiretroviral therapy, 332619 outpatient visits across 12 facilities, 889 children receiving tuition support, 12 clean water points constructed, and 7 antiretroviral therapy sites. It also states that there were 220 medical staff, 342 non-medical staff and 621 community health workers. Partners in Health, "Annual Report (2010)," Pg 19.